A reader sent us this camera phone photo of a sinkhole in Northern Milwaukee that swallowed a road, traffic light, and a Cadillac Escalade Thursday night. The giant sinkhole is likely the result of ongoing flooding in the area. This photo appears to show a newer SUV trapped in a large hole filled with crumbled asphalt and a traffic light near North and Oakland Avenues. 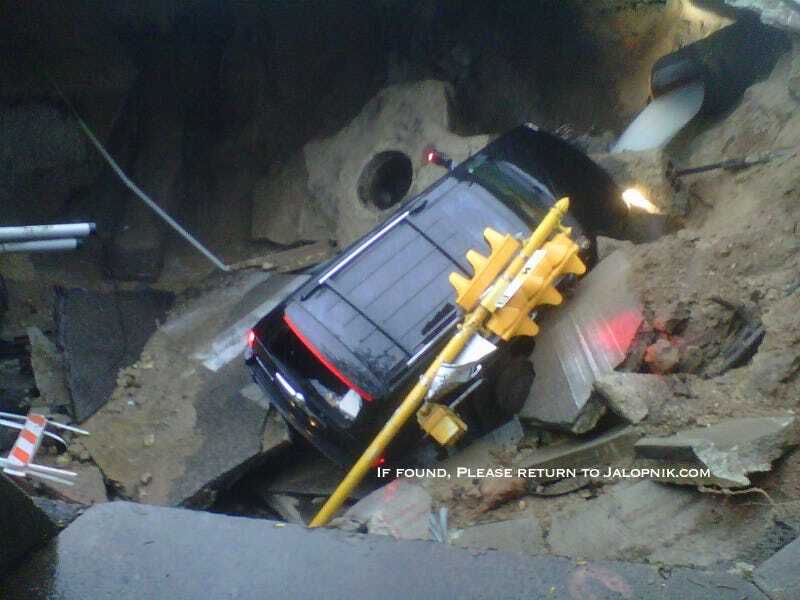 Milwaukee Police confirmed the incident happened the driver escaped without serious injury and the officer we spoke with was unaware of any other sinkholes in the area, though added there was still significant street flooding in the area. Mark Pawlik was waking along the avenue when the incident happens and helped rescue the driver. "The Escalade just went wham! Everything went down. The power line went like "pow" and then I think it was sewer water was just pouring into the hole." The driver pulled himself onto the hood of his car before falling into the hole. Eventually, Pawlik was able to grab the driver's belt loop and pull him to higher ground. The street remains closed. Here's another photo of the incident from @Mike_Thiel.